In this work the author explains why "brand" must come first before any other business consideration. He illustrates the rules for building and sustaining a sucessful brand and company no matter what the industry, using innovations in distribution, advertising, technology and product mix. "Branding" has developed into one of the business world's hottest concepts, and for good reason. Branding is cited as the secret ingredient behind the tremendous corporate gains realized in recent years by companies ranging from FedEx, Rolex, Starbuck, Volvo, and most interestingly, John Hancock. John Hancock is one of the oldest brands in America. But in one crucial aspect, the company was 15 years ahead of its time when David D'Allessandro arrived there in 1984. John Hancock was facing exactly the same threat back then that many competitors worldwide are just now waking up to: the threat of extinction at the hands of new competitors with a better command of technology and a better grip on the expectations of modern customers. In the last ten years, over a quarter of John Hancock's traditional competitors have indeed gone the way of the dinosaur. John Hancock, on the other hand, has maintained average annual growth of nearly 20%. Its revenues have tripled in the last eight years and it has managed to take its credibility in the shrinking insurance market and transfer that credibility to the thriving investment market to become a major player. Throughout John Hancock's transformation from a sleepy old life insurer into a dynamic financial services firm, President D'Alessandro has been the unconventional leader of a once conventional company. He is the first marketer ever to become President of a large life insurer, a maverick and a bomb-thrower who speaks the language of the new world from the corner office of an old-line concern. Thanks to Hancock's stellar performance and D'Alessandro's own unfailing quotability, he has appeared on TV programmes such as "Good Morning America", "The Today Show", "CNN" and the "Bloomberg Fortune" to offer his views on marketing intelligently in the modern world, and has been featured in countless newspaper and magazine stories. 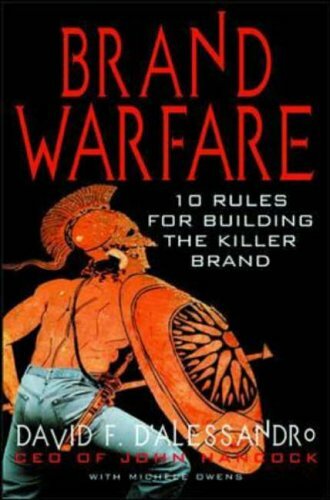 In "Brand Warfare: Ten Rules for Building a Killer Brand", D'Alessandro explains why brand must come first, before any other business consideration. And he shows how his "brand first" philosophy helped John Hancock transform itself by inspiring innovations in distribution, advertising, technology and product mix, all to serve the brand. He uses his first hand experiences at John Hancock, as well as the things he has observed at other companies, both as a public relations consultant and as a student of the marketplace, to illustrate the ten rules for building and sustaining a successful brand, and with it, a great company no matter what industry.